Regulator isolators and bypass facility for ease of maintenance. Non-isolatable relief valve for protection of downstream system and pipe work. 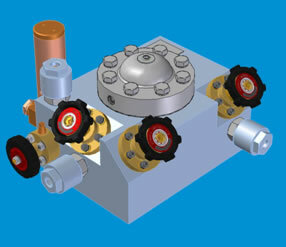 Downstream pressure gauge isolator with vent for gauge blow-down. 50 micron inlet filter protects regulator, downstream valves and equipment. Cartridge principle allows maintenance of all valves with block left in situ. All materials and cleaning compatible with breathing requirements. Applications: Divers Quality Air, Workshop Compressed Air, Engine Start Air. Design Pressure: 6000 psig at 100� F.
Temperature Range: -4 to 240� F.
Shock tested to Grade A medium-weight shock, Class 1, Type A Hull mounted, MIL-S901D. Vibration tested to MIL-STD-167-1, Type 1. CC-0505-101 110 3/8" 3/8" 8.3" 6" 3.75"